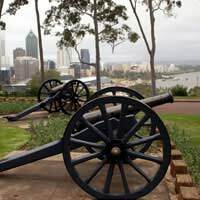 Australia is a country with military records that go back to its foundation as a penal colony, as soldiers arrived as part of the First Fleet to police the convicts and Australian servicemen have been involved in international wars since the start of the 20th century, when they fought in the Boer War. However, you're only going to find national records after 1901, when the new Commonwealth of Australia took over administration of the armed forces. From that point you can find military records in the Australian National archives. For everything before 1901, including records of British forces in Australia, you'll need to consult the various State Archives. For researchers, the Boer War poses an annoying problem. It lasted from 1899-1902, just as Australia was moving to Commonwealth status. This means the records are split between the National Archives and the State archives. The best rule of thumb is if you're looking for something pre-1901, try the State archives first, although the demarcation isn't perfect by any means. You can also find a list of Australians who served in the Boer War at the Boer War Nominal Roll. This can be a useful starting point to see if your ancestor served then. The National Archives has records for all the different branches of the Australian forces in the First World War - the First Australian Imperial Force, the Australian Flying Corps, the Australian Naval and Military Expeditionary Force, the Royal Australian Naval Bridging Train and the Australian Army Nursing Service. The records available for a service person will generally be the Service and Casualty form, which gives details of any unit transfers, movements and any promotions, as well as details on any injuries and treatment, plus whatever military correspondence relates to the soldier. There's also - most valuable for a family historian - the Attestation Paper. This is a document the serviceman filled out when he enlisted, with many personal details, including a description, age, place of birth, marital status, where he'd been employed and his next of kin. If your ancestor was a Naval officer, you might also try the Confidential Reports (also in the Archives), in addition to ships' ledgers, which give a full listing of the crew assigned to particular ships. The World War II records in the Archives contain much the same information as for the Great War, but you may also find discharge papers and if you're very lucky, a head-and-shoulders-photograph. Again, information about Naval officers might be found in the Confidential Reports, or in the published Navy lists, which give service details. Although you can find a few post-war Naval records in the archives, most service records after 1945 are still kept by the Department of Defence and aren't accessible. You can find Merchant Navy Record of Service cards on microfilm in the Archives' Canberra office. These give some personal details about the sailor, as well as which ships he was on and his period of service. You can also try the Australian Maritime Safety Authority, who have some Merchant Navy records. You're only going to find records of court-martial if they happened more than 30 years ago. They're in the Archives office in Canberra, with the proceedings registered and indexed. Where you have a citation number for the trial, the file should be easy to access. However, if you don't have a number, staff can consult the name index to find it for you. War gratuities were payments made to veterans after both world wars, given in recognition for service to their country. Although you probably won't find much useful information in the records, there might be snippets of knowledge. You'll have to search for them in the State archives offices.